Bratislava, the capital of the Slovak Republic, is situated on both banks of the Danube River and the adjacent slopes of the Little Carpathians. It lies at the crossroads of ancient trade routes at the site of a ford across the river. The first written reference was found in the annals of Salzburg in connection with a battle between the Bavarians and Hungarians below the castle Brezalauspurc in 907. 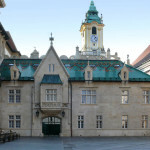 The present-day name Bratislava, previously Pressburg, has been used since 1919. The more or less continuous settlement of the territory dates back to the older Palaeolithic Age when the location belonged to the system of Celtic oppida. 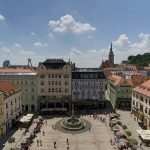 Its importance in the Roman Empire is proven by recent discoveries of Celtic – Roman buildings from the 1st century BC found in the acropolis of Bratislava Castle. The part of Bratislava lying south of the Danube belonged to the Roman province of Pannonia and was the site of a military fort called Gerulata. 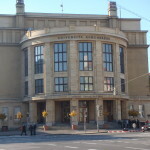 Gerulate was situated in the current district of Rusovce. It is probable that the area on the left bank near the bridge, today’s Water Tower, was also part of Pannonia. In the region unique remains of brick buildings from the 1st century BC at Bratislava Castle prove the existence of a Celtic prince’s residence, whose culture was under the influence of ancient Roman culture. Later, in the period of the Great Moravian Empire, a fortress with a palace and chapel was built on castle hill. In the 11th century there was the royal castle with a provost´s seat and a church. The older settlements below the castle were granted town rights in 1291 and partially incorporated into the town, surrounded by town walls. The basis of the town plan was created by the long-distance routes which passed through the town gates – the Michalská veža tower (see Museum of Arms – St Michael´s Tower) and the now destroyed Laurinská brána. On the west side the town continued along the fortifications towards the Vodná veža tower through the Rybárska brána gate. Inside the town both routes linked up with the street where the main market square is situated. The parish church, St Martin’s Cathedral, was also incorporated into the fortifications. Franciscan and St Clara monasteries settled on the edge of the town and burghers built the Town Hall in the centre. The first university in the territory of Slovakia was opened in 1467 under the name Universitas Istropolitana. The defeat at the Battle of Mohács in 1526 and the occupation of southern parts of the country by the Turkish army meant that Pressburg became the capital and coronation town of Old Hungary. Thereafter the congress of the Hungarian estates held its sessions here until the 19th century. The period of its greatest prosperity is connected with the rule of Empress Maria Theresa when it had the biggest population in the country. The empress had the inner walls pulled down and the moats and part of the Danube arm were filled to obtain space for the construction of new squares. During the Industrial Revolution horse railways were established in 1840 to Svätý Jur and in 1846 to Trnava. When the Czechoslovak Republic was declared in 1919 Bratislava became the seat of the Slovak government. Later on several national institutions were established in the town. Bratislava became the capital of the independent Slovak Republic in 1993. The historic core of the town is represented by the compact built-up area of the reservation. Apart from the only preserved gate, dominant features of the Old Town include medieval churches like the 14th-century St Martin’s Cathedral, which was used for coronations, and the St Clara Church and Monastery. The street leading northwards from the Cathedral is called Kapitulská and is one of the oldest streets in the town, containing former canonical houses and the Provost´s Palace. Today this palace functions as a seminary. 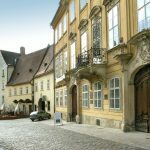 In the historic core there are several remarkable burgher houses and Baroque town palaces of significant Hungarian noblemen, such as Leopold de Pauli, Pálfi, Esterházi and Ziči. 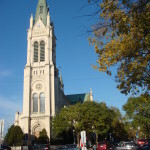 There are also less dominant churches like the Franciscan Church (the oldest preserved sacral building), the Jesuit Church built by German Evangelicals in 1636 and the St Nicholas Church built on the slope of castle hill. The Old Town Hall on the Main Square has been rebuilt several times since its foundation. 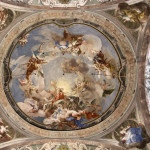 Abundant interior adaptations dating from the end of the 17th century linked up with contemporary Italian and Flemish paintings are of particular interest. As regards palaces in the square, the Rococo Kutscherfeld Palace and neighbouring Palace of the Royal Governing Council deserve attention. 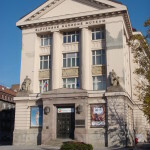 The Rococo Mirbach Palace on nearby Františkánske námestie square, dating from the second half of the 18th century, is the seat of the Bratislava City Gallery. 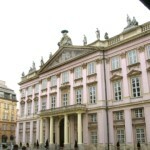 The Primate’s Palace built in 1778-1781 is one of the most remarkable Classicist buildings in the town. The Treaty of Pressburg was signed here on 26 December 1805 after the battle of Austerlitz. The development of the most characteristic feature of the town, Bratislava Castle, was very complicated. It acquired its present-day shape during the reign of King Sisigmund and subsequent Renaissance modifications in 1552-1562. The representative Theresian reconstruction from the end of the 18th century was destroyed by a fire in 1811. The castle ruin acquired its modern form thanks to the generous reconstruction that began in the mid 1950s and continues up to this time. In the late 1970s the construction of the Bridge of the Slovak National Uprising intersected the connection between the castle and the town. However, it revealed western town walls covered by newer buildings. The bridge construction demanded an aggressive and unsympathetic intervention into the historic quarters below the castle. Sadly only a few fragments have been preserved, these are the Renaissance and Baroque buildings which are concentrated around the small Church of the Most Holy Trinity. Today they serve as museums. 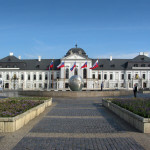 The Baroque Grassalkovich Palace, today´s Presidential Palace, with its adjacent garden lies close to the historic core, but beyond the medieval walls and palisades. The Town Conservation Reservation, which incorporates the area inside the medieval walls, the castle palace and the quarter below the castle known as Podhradie, was declared in 1955.